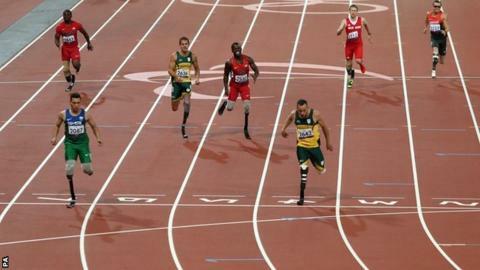 Oscar Pistorius has apologised for the timing of his comments following his loss in the Paralympic T44 200m final. The South African claimed gold medallist Alan Oliveira's artificial legs were too long and criticised the International Paralympic Committee. In a statement, he said: "That was Alan's moment and I would like to put on record the respect I have for him. "I want to apologise for the timing of my comments but I do believe there is an issue here." The world record holder was overhauled by Oliveira in the final 20 metres. The Brazilian clocked 21.45 seconds, with Pistorius second in 21.52. The IPC said all artificial legs - known as blades - adhered to strict regulations and had been verified and agreed before the race. But after his loss, Pistorius told Channel 4: "We are not running in a fair race. I don't know how you can come back, watching the replay, from eight metres behind on the 100 to win. It's absolutely ridiculous." Oliveira said the comments of his "idol" were hard to take. "The length of my blades is all right," he said. "I went through all the procedures with the referees. I believe Pistorius also knows that." Pistorius set a new world record of 21.30 seconds when qualifying for the final on Saturday, breaking the mark of 21.88 set by Oliveira in his own heat two races earlier. Pistorius issued his apology on Monday. "I accept that raising these concerns immediately as I stepped off the track was wrong," he said. "I am a proud Paralympian and believe in the fairness of sport. I am happy to work with the IPC, who obviously share these aims." It's another interesting debate over prosthetics. Some of the arguments that were levelled against Oscar in terms of fairness have turned on him. It's a tough one because Oscar has never been beaten in the 200m. I think a lot of his reaction was about being beaten because it has never happened before like this. It is sport, and it is tough for Oscar right now because there is a huge amount riding on this for him. Pistorius first contacted the IPC six weeks ago to complain about the length of another athlete's blades. His PR team made further representations two weeks ago. The IPC said it was the first time it had been lobbied in this way by an athlete or team. IPC communications director Craig Spence said they would meet Pistorius at a later date to discuss his concerns. "The IPC respects the significant role Oscar has played in raising the global profile of Paralympic Sport since his Games debut in 2004," said Spence. "Therefore we are more than willing to give him an opportunity to air his views in a non-emotional environment at a meeting to be organised at a later date." He added that "all eight athletes" had been measured before the race and were all legitimate. "The measurement is based on proportionality of the body," added Spence. "Clearly we don't want athletes running on stilts. We want athletes with a running prosthesis that is in proportion to their body." Peter van de Vliet, the IPC's medical and scientific director, said the formula that governed the maximum length of blades was complex and took into account various body measurements and height predictions. "You cannot compare two athletes," he said. "You cannot compare two sets of blades, two sets of prostheses. "We will listen to Oscar's questions. For the moment, the rules go with maximum allowed height. "When these formulas were developed, they were presented to athletes, coaches and feedback collected. It was the best system in place that we could go with to the comfort and satisfaction of everyone involved."